GoodTimes - the German magazine for music from the 60s to the 80s - is celebrating 50 years of REVOLVER, with five different cover pages of the Beatles. Learn more from the press release below. "It was 50 years ago today" when Klaus Voormann designed and completed the cover of the legendary Beatles album REVOLVER. And now, the artist has re-created his famous work once again, by exclusively working for the German music magazine GoodTimes. In the early days of August in the year 1966, the seventh Beatles album REVOLVER was released. Musically matured, the four musicians from Liverpool proceeded to say goodbye to the more lightweight Beat music that had established their world wide reign during the 1960s. REVOLVER (featuring songs like “Eleanor Rigby“, “Taxman“ or “Tomorrow Never Knows“ as well as “Good Day Sunshine“ or “Yellow Submarine“) was revolutionary for the band. It also pointed the way and in fact turned out to define the style of a musical direction which later came to turn into Psychedelic Rock. Matching the detachment and multi-layered character of the music was a task achieved by Klaus Voormann, a fellow friend and companion of the band from their Hamburg days. The musician and graphic artist, who was often called „the fifth Beatle“, has become a famous part of musical history by illustrating the legendary album with a cover that happened to be just as legendary. In his innovative and revolutionary black & white collage where he mixed line drawings and cut-outs, he enhanced the main motive - the heads of John Lennon, Paul McCartney, George Harrison and Ringo Starr – with highly detailed photo snippets in varied moods. Thus, Voorman revolutionized the era’s more plain and artless design of LP covers with simple photo shots of the artists, and he inititiated a truly massive innovative impulse in this artistic field. This is how Klaus Voormann managed to capture the unconventional, complex vibe of this golden age of creativity, which also characterizes the music of this highly experimental album. The REVOLVER cover is the most significant work that he has ever created. For this, he was honoured with a Grammy award, and he inspired many colleages to dare and try new ways in cover design.. The now 78 year-old artist once again retreated to his workshop in Tutzing right by Lake Starnberg in order to newly re-design the REVOLVER cover for its golden 50-year jubilee. This is how this series of five graphic creations took shape, which will be exclusively issued on the July edition of the music magazine GoodTimes – in cover illustrations as well as posters. 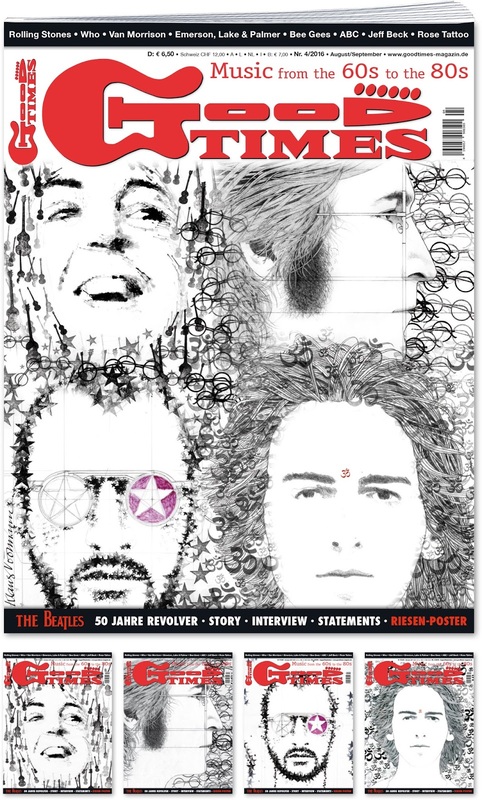 "Needless to say, everyone here at the publisher’s office is proud and grateful that Klaus Voormann spontaneously took part in making this project happen", says Fabian Leibfried, the magazine‘s chief editor, who is determined to serve the music of the 1960s to the 1980s. "There will be five variations of the cover – each of the Fab Four on their own as well as all the four of them together. Respectively, the illustration on the cover matches the one on the giant poster in the centrefold of the magazine." Starting on Friday, the 15th July 2016, the GoodTimes edition 4/2016 with the five issue variations will hit the shops. 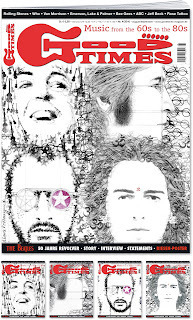 It will feature a comprehensive interview with Klaus Voormann on the history of the cover and all its consequences. BBFC Magazine Issue 59 Out Now!